One of our most popular styles is the 6602 Challenger. While it's a basic baseball cap, the construction is built to last and serves as a great base for any customization. Having a giveaway or using it for promotion? A velcro closure will ensure a perfect fit for everyone. 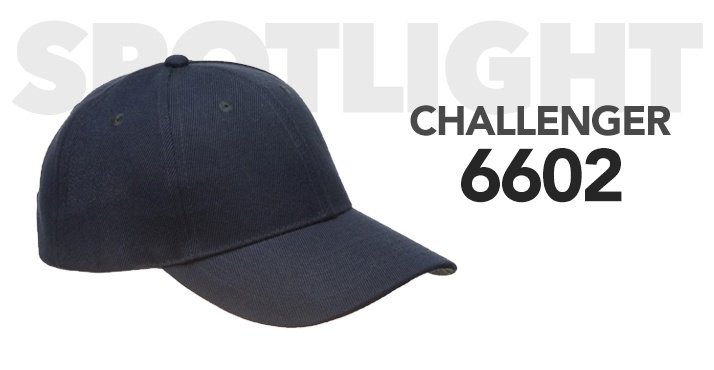 The 6602 Challenger cap is available in black, khaki, navy, red, and royal blue, allowing for an endless combination of customization options. The polyester material stands out from basic caps, giving your design a trendy and sporty look. The Challenger features a Velcro closure, so the cap is adjustable for any size head. This is a great cap for promotional use, an athletic team or even for your workforce. Just add your logo and go! This cap can handle a wide variety of customization options, which will you choose? Do you have an idea for a client or promotion that can take advantage of the Gravel structured cap? We can always send you a sample to review. Do you have any questions or would you like to speak to a designer about customization possibilities?